If you're a PlayStation fan or PC gamer, then I'm sure you've heard of the "Trails" series by now. Lately it's been gaining a lot of popularity in the west (at least for a niche title) with the constant releases and ports coming out, but I'm sure a lot of out you are asking one question... "What the heck is Trails?" So today I decided I'm going to try and answer that for you! Of course many of you already do know what it is, but hopefully you'll be able to learn a thing or two if you haven't actually played it for yourself. It's a pretty unique series, and one I'm sure many of you out there would enjoy if you give it a chance. With that being said, I'll be keeping spoilers out of this post, with only the basics being covered. No plot twists will be discussed, nor will the changes in the state of the world come up. While there will be some things I cannot avoid (as some parts of the series take place later), none of these will be major, nor will they ruin the experience for the players (hopefully you). So, let's do this! Now let me be the first to say that I'm not expert on the ENTIRE Legend of Heroes series. Most of the games have never even made it outside of Japan, and to top it off this whole thing started MANY years ago (in the early 1980s to be exact). Even so, the history of this series is pretty straight forward, but a bit confusing. Originally, "Dragon Slayer" was an RPG series that did things a bit differently than the others. Rather than using the classic turn based systems, it was an action RPG that used a battle system similar to that of The Legend of Zelda. The game was revolutionary for it's time, and as many popular games, it spawned a sequel -- "Dragon Slayer II: Xanadu." Needless to say, the Dragon Slayer series continued to be a hit from this point on, with Xanadu spawning a series of it's own (Tokyo Xanadu is actually releasing in the west pretty soon), and the main series eventually reaching it's sixth mainline entry. This was "Dragon Slayer: The Legend of Heroes." Like with Xanadu before it, The Legend of Heroes also became popular enough to spawn it's own series, but even that wasn't as straight forward. Like the Dragon Slayer series it was a part of, The Legend of Heroes began breaking it's own games up into series. With 1-5 being their own games with their own numbers (although 3-5 were a part of the same trilogy), when 6 came along things changed. This game was the first entry in what became known as "The Legend of Heroes: Trails in the Sky," and it was only one of three games to make up the entirety of "The Legend of Heroes 6." Sky First Chapter, Sky Second Chapter, Sky the 3rd all became the 6th entry, with the 7th and 8th entries also following a similar pattern -- and all being a part of what we now know as "Trails." Confused yet? Well let's put this simply. Dragon Slayer 6 = Start of Legend of Heroes, and Legend of Heroes 6 = start of Trails. We good now? Good! Let's move on then. 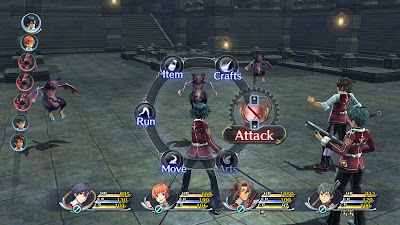 Unlike Dragon Slayer, the Trails series is a classic styled turn based RPG. Enemies appear on the map, you run into enemies, and battles begin in a semi open area. Rather than being your typical turn based RPG, battles in Sky are more similar to what you would expect from a grid based tactical RPG. You have your map, your characters will be placed at one end of it, and the enemies they are fighting will typically be at the other. During your turn you are free to move your characters anywhere within their "walking range," or you can attack enemies that are within your attack range (which is also your walking range). While some attacks will only hit a single target, other moves are AoE and will hit all areas that are highlighted as you select your target. Some of these attacks are "Craft" skills that are special attacks each character can use, but there are "magical" arts to use as well. These magic skills can be learned by any party member and are great for hitting enemey weaknesses, but they take multiple turns to charge and use. To learn and use these skills characters must equip orbs to their characters, which may not only enable them the use of skills, but also increase their stats as well. With this orb system in place, you can also freely remove and equip other orbs to change out your magical skills on the fly. As battles progress the order of turns is displayed on the side of the screen, and you're able to use this turn order for your advantage. Sometimes specific turns will receive special bonuses in the battle (such as that unit being healed on that turn), so by killing an enemy and taking their turn you can recieve the bonuses instead. Systems like these make the battle system more tactical based, and the cap on EXP gain keeps your characters from being too strong or too weak for that moment in the story. Thankfully if the game does get too hard, there is an option to retry battles and weaken enemies as well, so it's impossible to get stuck unless you refuse the extra help. While the basic gameplay and battle system can be a lot of fun, it's really not the main focus of the Trails series, nor is it what makes the game special. Instead that honor goes to the story, and the insane amount of love and detail put into crafting this world. 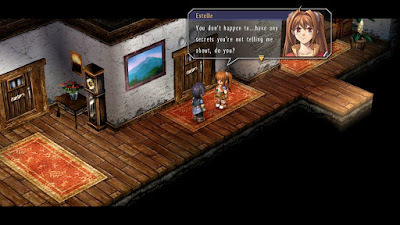 Trails in the Sky tells the story of a young girl named Estelle as she and her childhood friend Joshua set out to follow in her dad's footsteps to become a "Bracer." Joshua was found by her dad at a young age and was brought up along side Estelle almost as a brother, but his past is something that remains a mystery to her. Agreeing to wait until he is ready to tell her about it, Estelle accepts Joshua for who he is, and the two slowly become closer over time. When the two decide to join the Bracers guild (a group dedicated to helping those in need by taking on different types of jobs), they are forced out into the world to see it for their own eyes. Of course what starts out as a simple trip around the country to each guild branch soon turns into a grand adventure that will change their lives forever. While the story of Trails in the Sky may seem simple, it's one that is highly developed and evolves into something much more. The game starts in Estelle's small home town, and almost instantly it's clear just how much work went into this game. Rather than having generic NPC characters walking around, each towns person is a character of their very own, and each one of them has a story to tell. Talking to them multiple times will show you multiple lines of dialogue, and after every single event in the game this dialogue changes. These characters will go about their daily life, they will face their own issues, and as you continue to talk to them you'll get to see it all unfold. The game does a very good job of making these characters seem like living breathing humans, and over time you'll eventually start to realize just how deep the overall plot has become. Although Estelle's journey starts as a simple one, the world itself is complex and filled with history. Past wars and relationships with other nations play a big role in the overall story, and each town Estelle visits has it's own story to tell as well. Add in the fact that each town introduces dozens of new characters to the mix (some of which who will travel the world with you as well), and you have a single complex story with multiple layers to uncover. Estelle, Joshua, and the other characters who join them along the way are also a lot more complex than at first glance. The name "The Legend of Heroes" really is a fitting one, as these characters start as almost nothing. Estelle herself is just a simple country girl who is unaware of the world, and often makes stupid mistakes along the way. She's still a kid, and can act very immature. She's not someone you would call a hero, and it's hard to believe she could ever be a part of a serious group like the Bracers. However, as the game goes on that slowly starts to change, and we physically get to see how the events of the world shapes Estelle into the person she is by the end -- the game is rich with character development, and of course that extends to the side characters as well. The biggest thing many need to understand about the series is the fact that it is a heavily story based game. With a script that is multiple novels long, it's a game that will have you spend a lot of time reading, and it's story can be a bit slow. It isn't something you jump into and race to the end of, but rather a game you turn on to enter a new world to take your time and enjoy. A lot of the fun comes from discovering what this world has to offer, and the pay off in the end is well worth the wait. The thing is though, even this is only a small chunk of the story. Trails in the Sky "FC" is nothing more than a small, short (50-70+ hour) intro to the story. It brings in the characters, teaches you about the country they live in, and slowly starts to show the events happening behind the scenes. Yes it's a lot of content to go through, but it's still only a prologue to the series, and only an "intro" to the Sky story. In fact the game ends in a major cliffhanger, and fans in the West had to wait MANY years to see what came next. Or in other words, they had to wait for the main game. Sky SC picks up at the ending of FC and continues Estelle's journey. This game is much longer than the original, with much more content and all of the same features found in the first. Every character continues to be their own person with their own stories (a feature that never goes away), the character development continues to be strong, and the main plot finally takes center stage. Once again with multiple novels worth of dialogue, Sky SC continues to greatly expand the world, and it's the game that really sets the stage for the future of the series. 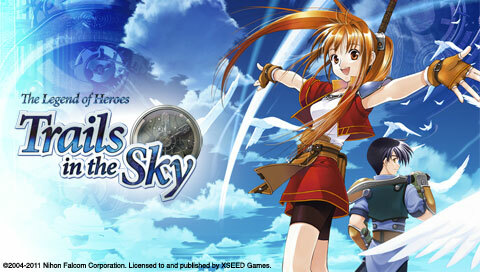 Finishing the Sky story arc, a third bridge title was also released. This one features a new lead character, but it does feature the party members from the past as well, and it's the game that puts a "close" to many of the hundreds of stories from the previous two games. The real goal in this game is to crossover to the new story arcs from the new "series," and continue the overall story as a whole. This is where Ao/Zero and the Cold Steel series come into play. Sadly the follow up to Sky was never released in the US, but it and Cold Steel take place at the same time roughly a year after the events of Sky. While Zero and Ao take place in the citystate called "Crossbell," Cold Steel goes north to the Erebonian Empire -- the country Estelle's country of Liberl was once at war with. While throughout the Sky series this country was mostly seen as an enemy, Cold Steel is the first time we actually get to see behind their walls and learn the truth about the country. Here status as a noble or commoner is of great importance, and things quickly begin heating up because of this. Mix in the fact that both the Empire and their rival country the "Republic" want to take control of Crossbell (which is also fighting for it's own independence), and it's easy to see that things aren't going well for Erebonia. This is where the two series both begin. While Zero and Ao tell the story of a police force within Crossbell during this political struggle, Cold Steel follows the story of a young man named Rean as he enters a military academy in Erebonia. With both games happening at the same time, together they make up the complete story of events that will eventually lead to Cold Steel 2 and 3. Sadly here in the west we can only fully see one side of the story, but maybe one day that'll change. In Cold Steel players take control of Rean as he lives through his academy life, but things end up being a bit different for him. Shortly after entering the academy, Rean is quickly put into a new special class called "Class VII," and is tasked with going on "field studies" each month. These field studies have him and his classmates shipping off to lands unknown (er, local towns and cities) to meet with different people, and help the towns out with their problems -- all while learning as much as they can as well. While Cold Steel still has the same NPC system as Sky, things are a bit more personal here. During your time at the academy, you get to follow the stories of all of the students. While your class members have special cutscenes all of their own, the other characters have unique side quests and sub stories to complete, and they all also continue the tradition of having unique dialogue and events after every in game story scene. As you talk to them and get to know them a bio will be filled out within your notes section, and you'll even eventually get to meet their other friends and families as you travel. As you return to the academy each month in game, you'll spend a lot more time with these characters, and by the end they'll feel like friends. The series itself still doesn't end with Cold Steel 2, in fact Cold Steel 3is already well on it's way, and it's very likely that this will not be the end. Eventually the series may reach the point where everything from the past comes together in one big final "show down," but for now the series continues to live on. Don't let this put you off from getting into it though, instead think of it as a reason to continue to invest your time. This is a massive story in one of the most developed RPG game worlds out there, and it's future is something for both fans and newcomers alike to look forward to. It's simply a great fun RPG series, that everyone who likes JRPGs should really look into... And hopefully one of those "everyones" will be you, if it already isn't.